In one of my Theories of interactivity classes we were asked to choose three projects related to our final project. It was important analyze them in relation to our project and find out about details, like i.e. funding. As my project is going to be related to keywords like real-time, installation, interaction, experimental typography, Internet, social networking, network, I was researching in these fields. was planned during 1 year on paper, before it was programmed in one week. In the first book, which has the title 'Reactive Square', he used microphone input to move 10 squares in different ways. In 'Flying Letters' he modifies typographical forms with the mouse movement, 12 o'clocks features the behavior of 'digital clocks'. 'Tap, Type, Write' he used the typewriter as an inspirational source; Mirror Mirror is based on Video images. Interesting about the project is the interactivity part, when the user interacts with objects, type, and images. I am mostly interested in the Flying Letters, which is related to my own project. 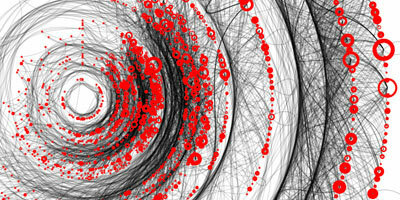 It shows a couple of type behaviors enabled by the mouse movement. Some sensor driven object/device/person could also replace the mouse movement. John Maeda's Reactive Books are stored in Ars Electronica Archives and are also part of MoMA's collection. "Oneword is an interactive system designed to sample and display audience's collective voice during an event. A social, public display of crowd moods and feelings during an large-scale event: people send SMS to a special number, the SMS's lenght is constrained to one_word. The messages are then displayed with a tree-like generative graphic software. As soon as a new message arrives a new branch blossoms. As the event unfolds layers of texts gradually build up a flowing foliage of collective memory. Night is One is a format of 5 events/parties around Italy (Milan, Florence, Rome, Naples and Torino) to present the new BMW series 1. Each party is art directed by a different Italian celebrity (Carlo Cracco, Victoria Cabello,Samuel Subsonica, Claudio Coccoluto, Stefania Rocca)." What I like about the project is the real-time input through the network via sms in this case. 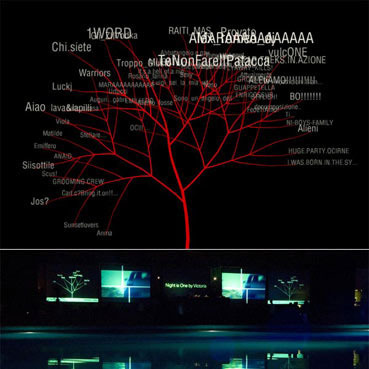 I also like the visualization of text, which is growing in the shape of a tree and is a metaphor fo data trees. Interesting about the project is the funding, which is the company BMW. It is not only an art/and design project, but also a promotional campaign for BMW. “Poetry on the Road is an international literature festival which is held every year in Bremen, Germany. Since 2002 I am commissioned to design a visual theme for the festival. 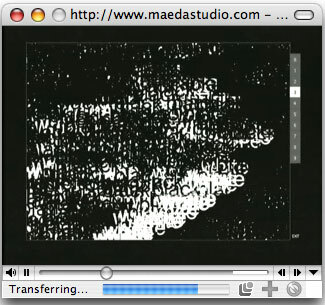 While the theme itself is changing, the underlying idea for the visuals is always the same: All graphics are generated by a computer program that turns texts into images. So every image is the direct representation of a specific text. The design and the development process are a collaboration with the design agency jung und pfeffer. The newest creation of Boris Mueller, famous for his (yearly reoccurring: online, interactive applications that are capable of visualizing textual input into very beautiful graphics, so that every image is the direct representation of a specific text, which can then be directly used as book illustrations. this year, an entire poem was considered to be a tree-like structure, that branches out over the page. Attached to these branches are the words of the poems, represented by leaves. More specifically, particular symbols in a text control the growth of the tree: specific letter-combinations create a new branch, others make it grow stronger. words are visualized as leafs: the amount of letters in a word is represented by the number of spikes on a leaf, whereas the letter sequence in a word also controls the overall shape of a leaf, such as the roundness of the shapes, the length of the spikes and the density of the color. the size of the leaves depends on the length of the poem." What I like about the project is that data are transformed to a different visualization. The data is still the same; it's just visualized in a different form. I also like that the project has the purpose of being part of the promotion for a literature festival. As the project is comissioned there is no issues about funding from the artist's side.